This lovely cathedral brings together several architectural styles. The Cathédrale de St-Sauveur is located in the heart of the old town of Aix-en-Provence (map), a ten to twelve minute walk from La Rotonde. Legend says it was built on the site of a temple of Apollo. Its history is long, having been built from the 5th to the 18th centuries. As such, its architecture includes elements of different styles—Romanesque gates and Roman walls, Gothic gates and towers from the Middle Ages. Its three naves represent Romanesque, Gothic, and Baroque architecture. The Baptistry is set on a 5th century stand. Inside, the modern throne of the Archbishop stands in contrast to the various historical styles. Next to the cathedral is the former Palace of the Archbishops, built in the late 17th and early 18th century. Today the first floor houses the Tapestry Museum. Going from the cathedral to the Clock Tower, walk down Rue Gaston de Saporta and admire the 17th and 18th century hôtels particuliers. These beautiful private mansions today are home to museums and concerts. The Clock Tower dates from 1510 and sits on Roman foundations. It has a 17th century astronomic clock. Right next to it is the lovely Hôtel de Ville. Aix-en-Provence has many other lovely churches, including the Église Ste-Marie-Madeleine in the Place des Prêcheurs. Currently under restoration, it dates from the 17th century. 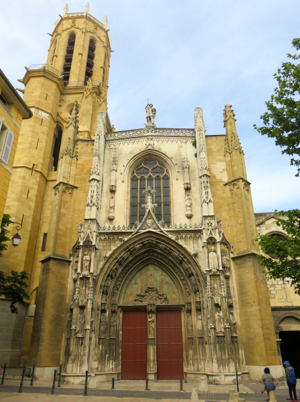 This replaced the former Dominican Couvent des Prêcheurs, which had been built in 1274. It's also a delight to hear the church bells ring in Aix, and they seem to ring a lot. 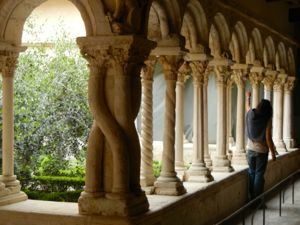 If you happen to be in Aix-en-Provence on a summer Saturday, you may also see (and hear) weddings in the area of St-Sauveur and the nearby Hôtel de Ville.